Nationally representative studies confirm that LGBTQ individuals are at an elevated risk of experiencing intimate partner violence. 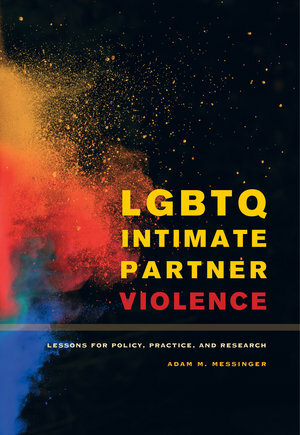 While many similarities exist between LGBTQ and heterosexual-cisgender intimate partner violence, research has illuminated a variety of unique aspects of LGBTQ intimate partner violence regarding the predictors of perpetration, the specific forms of abuse experienced, barriers to help-seeking for victims, and policy and intervention needs. This is the first book that systematically reviews the literature regarding LGBTQ intimate partner violence, draws key lessons for current practice and policy, and recommends research areas and enhanced methodologies. Adam M. Messinger is Assistant Professor of Justice Studies and Women's & Gender Studies at Northeastern Illinois University. 2. How Do We Know What We Know? 3. What Is LGBTQ Intimate Partner Violence (IPV)? 4. Why Does LGBTQ IPV Happen? 5. How Can We Improve Nongovernmental Responses? 6. How Can We Improve Government Responses? 7. Conclusions: Where Do We Go from Here?